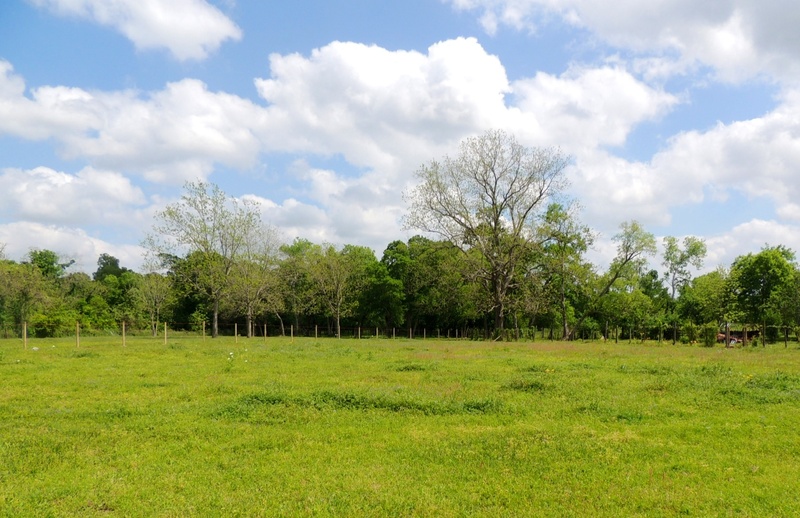 Looking down the meadow at New Six Meadow Farm. You can see the new arena fence line going in. The days have been flying by as Lauren and I move loads of hanging clothes and household items down the highway. Several friends at work just moved but it seemed to pretty much be a weekend affair. I think we could manage our things in a weekend. We would be tired but happily ensconced in our new house. We have more than a full jump course and thanks to Felicia some sturdy (read heavy) wing jumps. We have jump gates, a full set of barrels, a harrow drag for the arena, giant pasture sprinklers ( picked up in the great drought of 2008, or was that 2009? ), wheel barrows, saddle racks, assorted rakes (for manure, for leaves, for stalls), ten saddles-English/western from baby sized seats to my father’s old western saddle, and full horse wardrobes from rain sheets, fly sheets, turn-outs, award coolers, stable blankets, stable sheets, and baby Dakota’s original baby blanket. Lauren thinks there might be 30 or so wardrobe items (back to the hoarding accusation). Oh, and then we have at least 30-12 foot long solid wood jump poles. So far Lauren and I have loaded and hauled all the loads. Ally has helped upon arrival at the new place. This has wrecked havoc with Lauren’s healing back and my ever limited physical abilities. Four days in and the old house is looking pretty bare but not the shed, garage or barn. Wow! Movers are coming Thursday to move the big household items. Wonder what they would do if we asked them to load those 12 foot poles up? Probably wouldn’t go well. 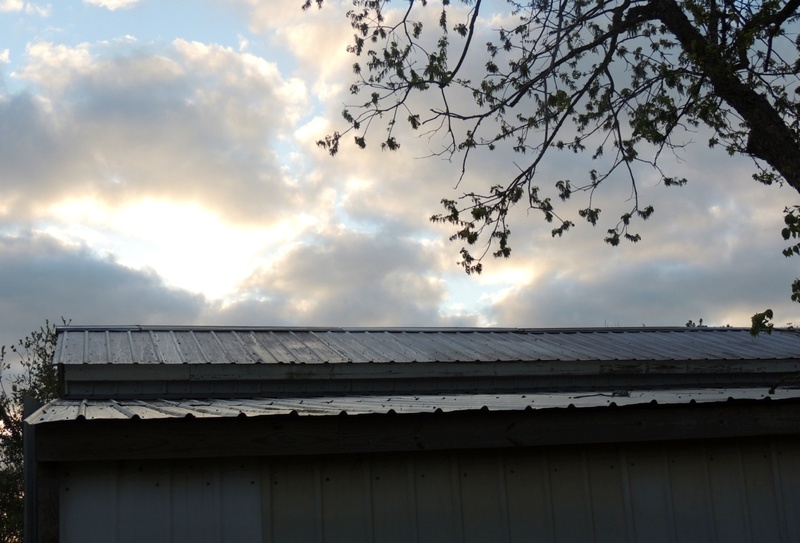 Dawn over the barn as we waited for the concrete truck to arrive. Friday the concrete arrived at dawn and it was pretty great seeing the first aspects of a lifelong dream (to design our own barn) unfolding in front of us. Kona was on hand to be sure all was going according to plan. 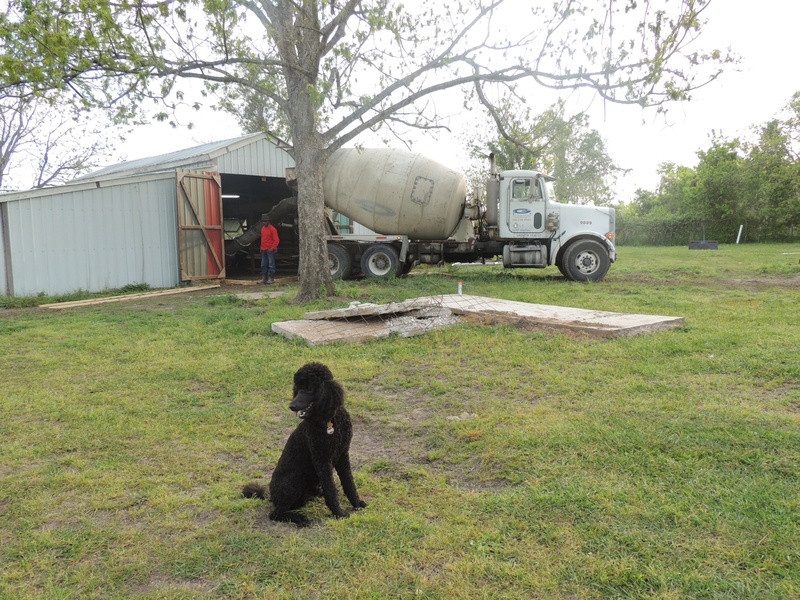 Kona and the concrete truck! 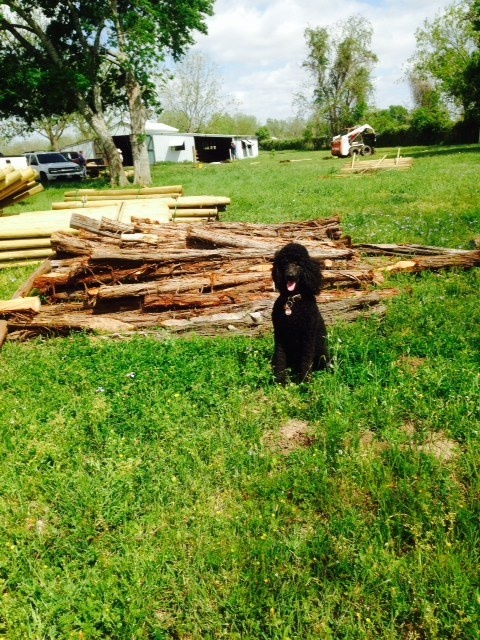 The wood posts for fencing and the arena arrived next. Kona quickly evaluated the load to determine if we had gotten everything we ordered. Kona after completing inventory of the fencing equipment. Today the work on the arena and fences got started. Bruno and Snow’s pasture have all the posts up. The arena has grown from our original dimensions. I am not sure what size it is ending up but it looks as if it could double as a football field, which is about a hundred feet longer than I had in mind. Oh well, in this case bigger is probably better. 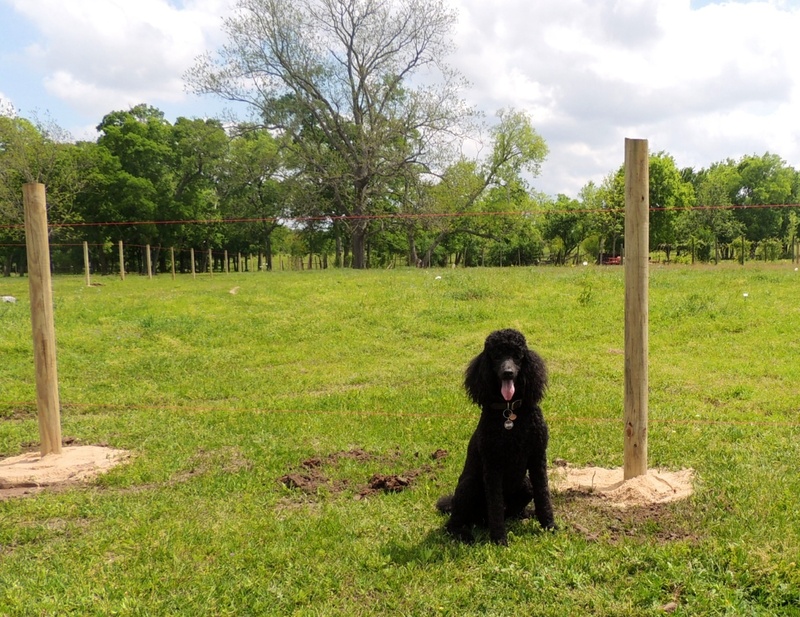 Once again Kona was on site to assure the posts were being set right. Are you starting to feel like a Where’s Waldo game is underway? So, all is well at NSMF. I figure about 40 more trips and we will shut the Wharton doors for good. This entry was posted in Life on the farm and tagged Moving barns, moving to a new horse property by Exechorseluver. Bookmark the permalink. Everything is under control. Kona is on the job. Love the pictures of him “on duty” but not SO busy he cannot take a moment to pose.